Produced by Peter Cooper and Eric Brace, the CD is a celebration of country music songwriting legend Tom T. Hall's 1974 album of songs for children of all ages. The songs on the album were performed by Tom T. Hall, Patty Griffin, Buddy Miller, Duane Eddy, Bobby Bare, Peter Cooper, Eric Brace & Last Train Home, Jim Lauderdale, Elizabeth Cook & Tim Carroll, Gary Bennett, Mark & Mike (Mark Horn & Mike "Supe" Granda), Jon Byrd, Tommy Cash, Bobby Bare, Fayssoux Starling McLean, and Baker Maultsby. The band included Lloyd Green on pedal steel guitar, Jen Gunderman on keyboards, piano, and accordion, Mike Bub on bass, and Mark Horn on drums. The album was recorded at Tom T. and Dixie Hall's Fox Hollow farm. Engineers were Richard McLaurin, Alex McCollough, Troy Engle, and Adam Bednarik. It was mixed by Adam Bednarik at House of David and mastered by Alex McCollough at Yes Master in Nashville. Original album artwork was created by Julie Sola, with CD design by Bill Thompson. I Love: Tom T. Hall's Songs of Fox Hollow is a co-release of Red Beet Records and the Country Music Hall of Fame's CMF Records. The Grammy Award winners will be announced on February 12, 2012. Recently, Brace and Cooper hosted a Tom T. Hall Night on the weekly radio program, "Music City Roots: Live from the Loveless Cafe." McLean and Cooper performed "I Made A Friend of a Flower Today" co-written by the imcomparable, legendary, Queen of bluegrass songwriting, Dixie Hall who also wrote "Ole Lonesome George the Basset." They were joined on stage for the final verse by Hall. Click here to see a really cool video of the performance. Says Miss Dixie: "No matter what our genre alliance may be, we were all kids once, and it is impossible not to be touched yet again by this magical collection." The original Songs of Fox Hollow was born one long-ago summer, when two young nephews of Tom T. and Dixie Hall spent the summer roaming the farm and asking Tom T. a host of questions about the land and the animals. To the kids, Fox Hollow was a place of activity and enchantment, and pretty soon Tom T.’s answers began to rhyme. The record that came about offers kids laughter, melody, and lessons in kindness, care, and conservation. For adults, it offers the same, as well as a welcome window into our kids’ thoughts and feelings. When it was released in 1974, Tom T. Hall’s Songs of Fox Hollow produced three No. 1 hits, “I Love,” “I Care,” and “Sneaky Snake,” and the album entered the consciousness of a generation. At Red Beet Records they decided it was time for another generation to hear these wonderful songs, and set out to re-imagine the time-honored work. For a week in June 2010, Peter Cooper and Eric Brace rounded up fellow Tom T. fans and headed to Fox Hollow, the farm that inspired Songs of Fox Hollow and is still home to Tom T. and Dixie Hall. Over three magical days in this idyllic setting just south of Nashville, they recorded the eleven songs that made up the original Songs of Fox Hollow, plus a brand new tune written especially for this release by Tom T. and Dixie. 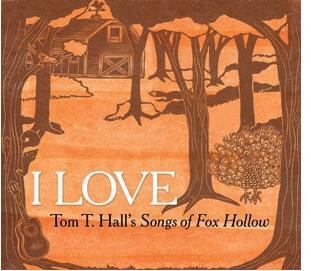 Titled I Love: Tom T. Hall’s Songs of Fox Hollow, the CD features a different vocalist on each song: Patty Griffin sings “I Love,” Buddy Miller performs “Sneaky Snake,” Bobby Bare sings “I Care,” Jim Lauderdale’s take on “I Like to Feel Pretty Inside,” Eric Brace sings “The Mysterious Fox of Fox Hollow,” and Tom T. himself joins Fayssoux Starling McLean on the Hall’s new song, “I Made a Friend of a Flower Today.” Rock and Roll Hall of Famer Duane Eddy lends his twangy guitar to two of the tracks. What do Patty Griffin, Duane Eddy, Bobby Bare, and Buddy Miller have in common, besides being icons of American music? They’re Tom T. Hall fans, and this new record proves it. Indie label Red Beet Records has joined with the Country Music Hall of Fame’s CMF Records to release what is destined to be a new children’s classic, I Love: Tom T. Hall’s Songs of Fox Hollow. The album also includes Jim Lauderdale, Tommy Cash, Elizabeth Cook, Eric Brace & Last Train Home, Peter Cooper, and many more, including Tom T. himself. The record release took place on May 25th at the Country Music Hall of Fame’s Ford Theater. The Band: Pedal Steel Guitar Hall of Famer Lloyd Green, a gentle maverick who altered the musical language of country music and played on recordings by Paul McCartney, The Byrds, Charley Pride, Don Williams, and thousands of others; Jen Gunderman (keyboards, accordion, spoons), a veteran of The Jayhawks and Last Train Home who has lately been in the studio with such artists as John Prine, Emmylou Harris, and Lyle Lovett; Mike Bub (bass), a five-time IBMA award winner and a Grammy winner for his work in the Del McCoury Band who has played with Earl Scruggs, Jimmy Martin, John Hartford, and Bill Monroe; Mark Horn (drums), a former Derailer who has also played with Chuck Mead, Todd Snider, and many more. Mark also sang about the one-legged chicken.